New national coat of arms for South Africa were adopted on 27 April 2000. The former Arms granted by Royal Warrant to the then Union of South Africa on 17 September 1910 changed only slightly over the years. The Arms did not change when South Africa became a Republic on 31 May 1961 and were adopted unchanged in the Interim Constitution which came into force on 27 April 1994. No mention is made of the Arms in the 1996 Constitution (unlike the flag which is outlined in Schedule 1). Details of the New South African Coat of Arms as unveiled yesterday, the 6th anniversary of Freedom Day by President Mbeki. These Arms replace those which have been in use since 17 September 1910. The Coat of Arms is a series of elements organized in two distinct circles placed on top of one another. The Motto: !ke e:/xarra//ke, is written in the (now extinct) Khoisan language of the /Xam people and literally means: diverse people unite. It addresses each individual effort to harness the unity between thought and action. On a collective scale it calls for the nation to unite in a common sense of belonging and national pride - Unity in Diversity. Elephant Tusks symbolize wisdom, strength, moderation and eternity. The ears of wheat in the circle formed by the tusks symbolize fertility, growth and the development of the potential, the nourishment of people and the agricultural aspects of the earth. The shield is shaped like a drum and has a dualistic function - the display of fertility and of spiritual defence. The human figures on the shield are derived from the images of the Linton Stone, a world famous example of South African Rock Art, which is now housed and displayed in the South African Museum in Cape Town. The Khoisan, the oldest known inhabitants of South Africa, testify to our common humanity and heritage as South Africans. The figures are depicted in an attitude of greeting to symbolize unity. This also represents the beginning of the individual's transformation into the greater sense of belonging to the nation and by extension, collective humanity. The spear and knobkierie are dual symbols of defence and authority and also represent the powerful legs of the Secretary Bird. The spear and knobkierie are lying down to symbolize peace. The protea is an emblem of the beauty of South Africa and the flowering potential of the nation in pursuit of the African Renaissance and also symbolizes the holistic integration of forces that grow from the earth, nurtured from above. The Secretary Bird, characterized in flight, is the natural consequence of growth and speed. It is a powerful bird whose legs, depicted as the spear and knobkierie, serve it well in its hunt for snakes symbolizing protection of the nation against its enemies. It is a messenger of the heavens and conducts its grace upon the earth, in this sense it is a symbol of divine majesty. Its uplifted wings are an emblem of the ascendance of the nation, whilst simultaneously offering us its protection. The rising sun is an emblem of brightness and splendour. Its symbolizes the promise of the rebirth, the active faculties of reflection, knowledge, good judgment and will-power. It is the symbol of the source of life, of light and the ultimate wholeness of humanity. The completed structure of the of the Coat of Arms combines the lower and higher circles in a symbol of infinity. The path that connects the lower edge of the scroll, through the lines of the tusks, with the horizon above which the sun rises at the top, forms the shape of a cosmic egg from which the Secretary Bird rises. In the symbolic sense this is the implied re-birth of the spirit of South Africa. The coat of arms was designed by Mr Iaan Bekker of the design agency, FCB. A previous design submitted by the Heraldry Council was rejected by the Cabinet, which then approached design agencies to present their concepts. Mr. Bekker's design was one of three which was considered by the Cabinet. The Bureau of Heraldry hereby gives notice in terms of section 5 (a) of the Heraldry Act, 1962 (Act No. 18 of 1962), of the registration of the new national coat of arms of the Republic of South Africa. Arms: Or, representations of two San human figures of red ochre, statant respectant, the hands of the innermost arms clasped, with upper arm, inner wrist, waist and knee bands Argent, and a narrow border of red ochre; the shield ensigned of a spear and knobkierie in saltire, Sable. Thereabove a demi-secretary bird displayed Or, charged on the breast with a stylized representation of a protect flower with outer petals Vert, inner petals Or and seeded of nine triangles conjoined in three rows, the upper triangle Gules, the second row Vert, Or inverted and Vert, and the third row Vert, Or inverted, Sable, Or inverted and Vert. Above the head of the secretary bird an arc of seven rays facetted Or and Orange, the two outer rays conjoined to the elevated wings. Upon a riband Vert, the motto !KE E:/XARRA //KE in letters Argent. Issuant from the ends of the riband two pairs of elephant tusks curving inwards, the tips conjoined to the wings of the secretary bird, Or, therewithin and flanking the shields, two ears of wheat Brunatre. I was just wondering what South African flags will be affected by the new coat-of-arms. For instance, under apartheid the presidential flags had the coat-of-arms on them, but I don't know if presidents Mandela and/or Mbeki use a presidential flag. What I'd like to know is how one reads that "thing". I read somewhere that the exclamation mark is for sound of "clicking" with tongue, but what are the slashes and double shlashes? "An approximate pronunciation of the new motto is: (click)-eh-air-(click)-gaara-(click)-eh. The first click is produced by flicking the tongue against the front of the palate. The second is produced by pressing the tip of the tongue against the front teeth. The third is made by sucking air through the side of the mouth. The "g" is guttural." So, just start practising your San. Bruce did say the Khoisan were extinct. Last figures seem to suggest that somewhere between 8.000 and 11.000 still exist, Free to move inside the Kalahari Desert and Gemsbok Park - about 700,000 sq km (250,000 sq mi), situated between South Africa, Namibia and Botswana. The Khoisan language is NOT related to Xhosa (not even the click sounds). Xhosa is like all other southern African languages, Bantu related. The Khoisan language and the San People (Hottentots, Bushmen, Khoikhoi, Pygmies, or whatever other name they have been known under), are the only exception. San was chosen because they were the first South African people, and it is meant as a subtle sort of reminder that considering that fact, all other South African peoples are interlopers of a sort, and perhaps they should all just try to get along. Does anyone know when the new coat of arms officially adopted? The government homepage mentions the new coat of arms was announced on Apr 27 2000. Is this the official date of adoption? The official date of adoption of the new South African Coat of Arms is 27 April 2000. ARMS: Quarterly per fess wavy: I, Gules a female figure representing Hope, resting the dexter arm upon a rock, and supporting with the sinister hand an anchor Argent; II, Or, two black wildebeest in full course at random, both proper; III, Or upon an island an orange tree Vert fructed proper; IV, Vert a trek wagon Argent. CREST: On a wreath of the colours, a lion passant guardant Gules, supporting with the dexter paw four staves erect, alternately Argent and Azure and branded Or. SUPPORTERS: Dexter a springbok and sinister an oryx (gemsbok), both proper. COMPARTMENT: Below the shield, on a compartment grassed Vert, two Proteas each with two flower heads proper. The shield is quartered with symbols from each of the original four areas (later provinces) which came together to form the Union of South Africa, viz Maiden of Hope (Cape of Good Hope), wildebeest (Natal), orange tree (Orange River Colony) and the trek-wagon (Transvaal). The Arms of the Union of South Africa as recorded by the London College of Arms in 1930. An "embellished" version was approved on 21 September 1932 and came into use during 1933 and became the official coat of arms although versions of the so-called "un-embellished" arms as shown above continued to be used on official documents, government stationary etc. 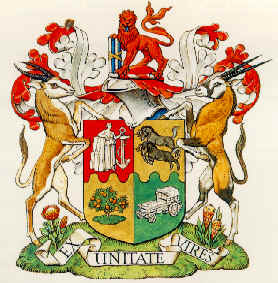 The first coat of arms of South Africa were adopted following the formation of the Union of South Africa on 31 May 1910. Since the Union was created out of the Cape Colony, Natal Colony, the Orange River Colony and the Transvaal (the latter two being the former Boer republics which had ceased to exist at the end of the Anglo-Boer War in 1902), there was adequate heraldic material on which the new arms could be based. Accordingly, the shied of the new arms was divided into four and contained images from the arms of the four colonies which formed the Union of South Africa. "Quarterly per fesse wavy First Quarter Gules a female figure representing Hope resting the dexter arm upon a rock and supporting with the sinister hand an Anchor Argent Second Quarter Or two Wildebeesten in full course at random both proper Third Quarter Or upon an island an Orange tree Vert fructed proper Fourth Quarter Vert a Trek Waggon Argent And for the Crest On a Wreath of the Colours A Lion passant guardant Gules supporting with the dexter paw four staves erect alternately Argent and Azure and branded Or And for the Supporters, On the dexter side A Spring Buck and on the sinister side An Oryx (Gemsbuck) both proper together with the motto EX UNITATE VIRES"
Transvaal Colony in the fourth quarter by the trek wagon. The motto is from that of the former Zuid-Afrikaansche Republiek's (Transvaal) Eendracht maakt Magt being translated into Latin as Ex Unitate Vires (Unity is Strength). The Arms were used until 1930 when, following criticism of their artistic merit, it was decided that they be redrawn.